And, most importantly, will good SEO actually guarantee you that coveted spot on Google’s search results page? As it turns out, the steps you take to optimize your site content are only one piece of a much bigger puzzle. As a content creator, you know what you want from SEO: You want your content to show up when someone searches for keywords related to whatever you’ve written about. Businesses use SEO to connect potential buyers with the company webpage. Bloggers use SEO to attract readers with questions about whatever the blogger’s specific niche is. If you’re throwing content onto the internet, you want someone to see it. But from the search engine’s perspective, sites must earn that coveted top search results position. High-ranking sites are those that answer a searcher’s needs. They should be thorough, accurate, and authoritative. Those aren’t qualities that can be guessed from a site’s keyword density, which is why search engines like Google and Bing put a lot of time and technology into measuring a site’s reputation. Put simply: It’s just not enough in 2019 to use the right words. You have to have the reputation to back them up. Some good SEO practices are related to how you create your content: keyword density, number of links on the page, length of the content, and way you use header text. Other factors live behind the scenes on the website, such as the age of the domain and how clean the underlying source code is. 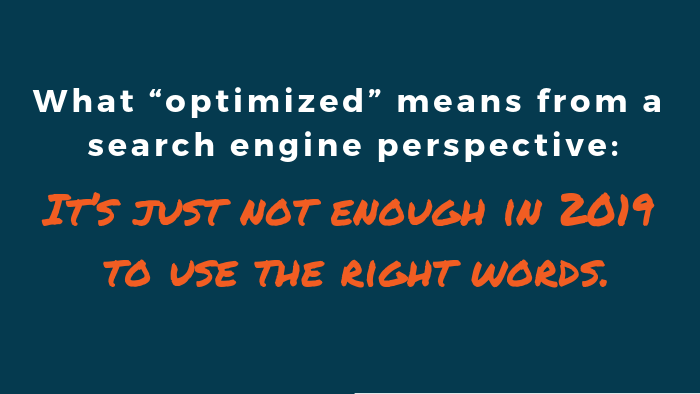 But some factors don’t live on the optimized site at all. Search engines are now able to look at a site’s reputation with a shocking amount of insight. “Implied links,” or mentions of a site that do not hyperlink to it directly, can now be tracked by Google. Search engines also are starting to analyze tone and context of brand mentions. In other words, if a site suddenly blows up on Twitter for being disreputable, that might start to hurt its SEO rank. So How Do You Improve Your Site’s Off-Page SEO? Although you can’t always directly influence your site’s reputation with Google, there are a few things you can do that will help to boost your site rank. Maintain an active social media presence in relevant places like Twitter and Facebook and whatever additional platforms make sense for your niche. Secure positive mentions on authoritative sites within your industry, such as with guest blogs or product reviews. Make your content share-worthy and facilitate social sharing through “retweet this” buttons, campaign hashtags, and other such techniques. Choose a unique, brandable identity so mentions of your brand can be more easily tracked. Have your site listed in niche directories and social bookmarking sites relevant to your industry. Generate organic buzz by sending press announcements for newsworthy events and accomplishments. If all of that sounds an awful lot like regular marketing, you’re correct: Modern SEO swiftly is becoming indistinguishable from classic marketing. When looking to boost your site’s rank with the search engines, you should be thinking of the kinds of things that would capture the attention of real readers – that’s Google’s end-game and it’ll give you a big advantage over the brands that are still stuck in 2007-era linking strategies and other worn-out forms of search optimization. Tiana Gibbs is an Associate Customer Content Specialist with PR Newswire moonlighting as a freelance copywriter. When not writing for the web, she can be found trying (and sometimes failing) to build an urban homestead in the Land of Enchantment.